Published on Tuesday, October 11, 2016. This article appears in the October/November 2016 issue of American Craft Magazine. If you’re looking for Hank Murta Adams, try out back at WheatonArts, where the artist has an Airstream parked near a brick patio strung with festive lights. Since 2003, he has been pouring his energy into this 65-acre arts complex in Millville, New Jersey, serving as its glass studio creative director. Under his watch, Wheaton has reimagined and expanded residencies, and produced innovative exhibitions – growing its influence and community. “The downside about being part of a community: It needs, and it needs, and it needs,” Adams observes good-naturedly. But community has also always been part of his practice, a necessary counterbalance to the solitude of the creative process. It’s what initially drew Adams, studying painting at Rhode Island School of Design in the 1970s, into glass. Hungering for physicality and dimensionality, he’d already begun doing sculptural work. Glass offered more. But while connections sustain Adams, his work embodies a fierce independence. 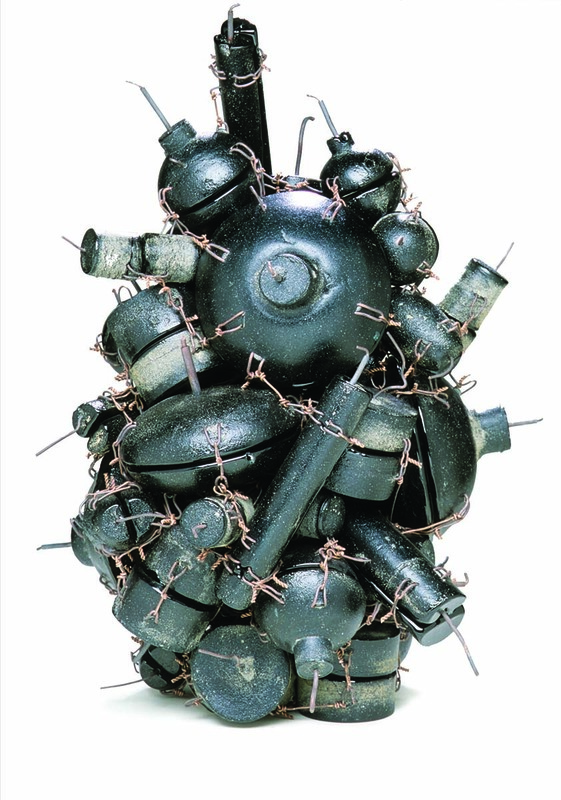 Merely one example, his large-scale, figurative busts – kiln-cast, crusted with wire, pocked with debris – upended glass-making tradition (to say nothing of classical sculpture), establishing Adams early on as an open-minded risk taker, an innovator, and an unmistakably individual voice. Recently, he lent that iconoclastic spirit to a major project at Wheaton: “Emanation: Art + Process” opened in May 2015 and ran through early January. 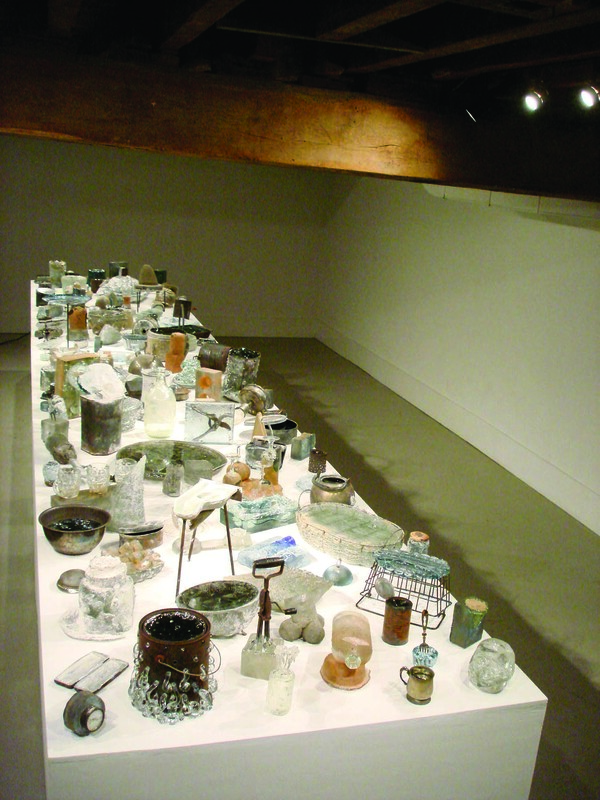 It was the culmination of a yearlong invitational initiative, where 11 artists, including Mark Dion and Judy Pfaff, came to the campus, and conceived and created work with the staff. The Wheaton crew then fabricated, finished, culled, and installed the work. “It created a very different power structure,” Adams explains. Instead of a curator selecting pieces, artists were picked – and the work flowed out of the communal, on-site experience. “I think it’s very honest to what the institution is and has been doing,” Adams says proudly. 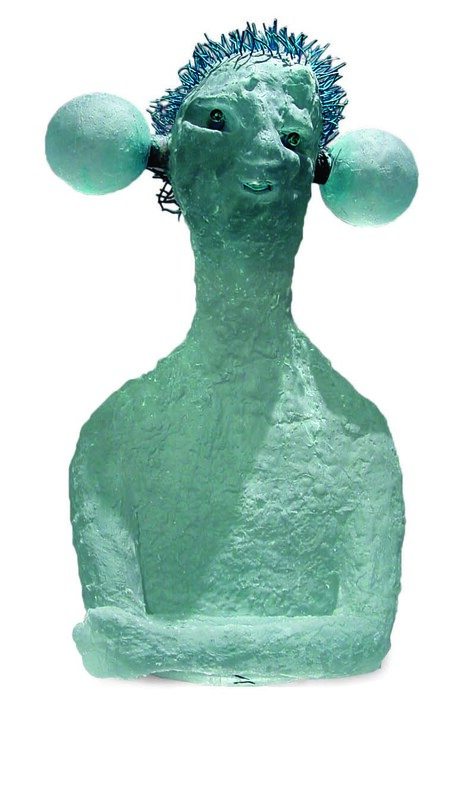 Adams is perhaps best known for his expressive figurative busts, such as Dumbbell (2003), of glass and copper.